In its six-year history, the Clark County Farm Bureau Agriculture Day has covered a lot of ground -- literally and figuratively – to give local farmers an opportunity to observe various farm operations. This year’s tour focused on two of the traditional staples of the county’s farm economy - - tobacco and corn - - with visits to Anderson Brothers Farm, the Perdue Grainery and Southern States Feed Mill. Attendees enjoyed a nice tour around the tobacco fields of Anderson Brothers Farm. Clark County FB President Shane Wiseman played host for the annual event sponsored by the organization along with the extension office, conservation district, cattleman’s association, Chamber of Commerce and Southern States. While many county Farm Bureaus support such events, Clark County is one of the few that takes the lead in organizing a day to focus on local agriculture. Agency Manager Rick Mink is instrumental in planning and conducting the event. Wiseman, who is on the KFB Board of Directors, explained that the leadership of Clark County FB wants to ensure that the agriculture sector doesn’t lose its place as a vibrant part of the county’s culture. Home base for the tour was a 165-acre farm owned by Kenneth and Shirley Anderson. They have operations at three other farms in the county, as well. 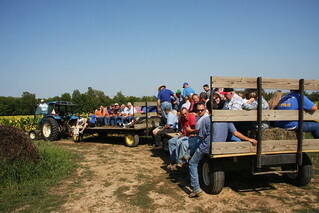 At the main farm the participants climbed on flatbed wagons for a tour of tobacco and cornfields. The Andersons are huge tobacco producers, with 90 acres of burley plus greenhouse production of some three million tobacco plants. “Tobacco is still king around here,” Kenneth said to the group. Their operation also has 400 cows, 40 ewes and other greenhouse commodities, including hydroponic lettuce. “There’s never a dull moment around here,” Kenneth quipped. This summer’s epic drought hasn’t hit Clark County as hard as most places, as evidenced by good quality tobacco and corn crops at the Anderson Farm just west of Winchester. Several of the farmers said the Andersons had the best looking tobacco they had seen this year. Next on the agenda was the Perdue Grainery, which is just off I-64 on the outskirts of Winchester. Plant manager Brian Stephens spoke to the visitors about the facility’s history and current operations. The facility handles corn, soybeans and wheat from hundreds of Kentucky farms; some from more than 100 miles away. Top customers for corn are Buffalo Trace Distillery and the adjacent Southern States Feed Mill, which manufacturers bagged feeds. A lot of soybeans are shipped out for the export market and some of the wheat goes to a miller that makes crackers for Wendy’s Restaurants, Stephens said. Local crops were so abundant last year that the grainery had four of the top five busiest days in its history. Oftentimes farmers had to wait two hours or more to unload, Stephens said. 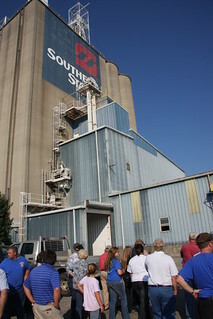 At the Southern States Feed Mill the group was informed about the 30-year-old business of producing bagged feeds for virtually every kind of farm animal, including dogs, cats and rabbits. The products go to 135 private dealers along with Southern States stores. The Winchester facility proudly boasts of being the first fully automated feed mill in the U.S.
From there the group returned to the Anderson Brothers Farm for a cookout dinner and a look at the greenhouse operation.